This is a special course! Golfers who love golf, and race car enthusiasts are in heaven here. I admit, I am not much of a race car fan - but I was in total awe of the environment around the Indianapolis Speedway - Motor capital of the World! 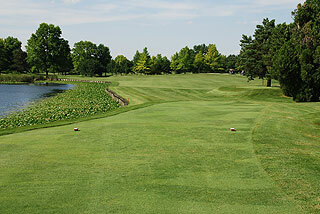 This golf course is situated immediately adjacent to the race track, with 4 holes that actually play into the infield of the Speedway. Golfers will encounter an incredible layout, with excellent shot selections, outstanding conditioning from tee to green, and wonderful service. 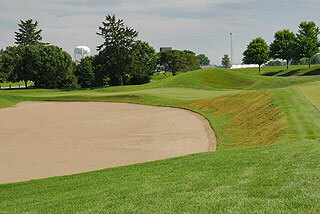 The layout winds along a rolling terrain and is adorned with intricate sand traps, featuring sandy waste areas, pot and conventional style bunkers. The traps on the initial holes are quite tame, but the designs become more complex as the round progresses. 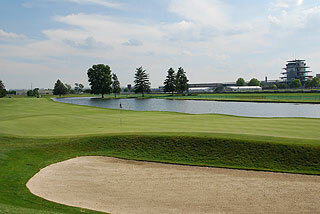 Each golfer I spoke with on my review round commented that this course was the BEST IN INDIANA! The variety of holes plays into this theory. The round begins gently with some open fairways that are fairly level, then traverses some rolling terrain with surprising elevation changes. 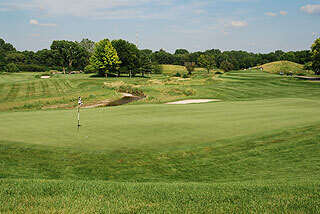 There are meandering creeks that demand accurate shot placement, with some spectacular par threes along the way. The third green complex even features a railroad tie bunker, a Pete Dye signature feature. There is generally ample landing areas on the fairways, but golfers will have to remain focused as twists and contours along this track result in some very challenging golf holes. With the race track in such close proximity, one is never too far from the grandstands that encircle this revered ground. I took the liberty of venturing into the stands (which are open for public viewing by the way), and had the pleasure of watching a few cars during practice runs. It is an awesome sensory experience! The clubhouse features a restaurant and outdoor patio (open for breakfast and lunch - call for days and hours of operation) that is highly recommended, and an expansive pro shop is located downstairs. Accommodations are available in a standard hotel that is adjacent. 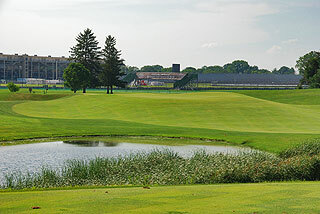 Practice facilities include a targeted grass range next to the Indy grandstands, a spacious putting green plus short game area with sand bunker. Four sets of tees play to distances and slopes that measure 6994 yards/137 slope, 6621 yards/130 slope, 6028 yards/122 slope and 5038 yards with a slope of 116. Sprinkler heads are measured to the center of the green, and Leading Edge Technologies GPS is standard on all carts. 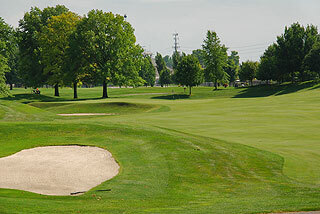 As with most Indianapolis golf facilities, walking is allowed at all times. This is a very walk-able layout, minus the long distances from tee to green that can be found on many courses. 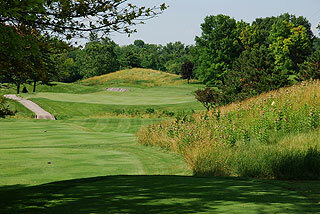 Golfers will have to traverse some undulating terrain however, particularly on the back side. 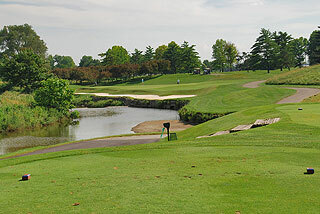 A creek that winds through the property provides some scenic golf environments, while also challenging the shot making abilities of even the best of players. My favorite section of the course was the sequence of holes seven through 10. From the sixth green, golfers venture through a tunnel to the infield of the race track - where holes 7, 8, 9 and 10 are situated. From the elevated seventh tee one can see the track clearly, and witness drivers practicing (as often is the case). The two photos above provide views of the seventh green, and also of the track and stands behind the tee area. The carry to the plateau green on seven is far less than the carry into the stands - for those who are tempted! The finishing holes are quite spectacular, with sloping, winding fairways and an intersecting, meandering stream that makes the final holes a breathtaking experience. One can make or break their round in this final segment. As with many of the green complexes on this track, there is usually ample room for recoveries, but trouble awaits if one misses to the incorrect side. 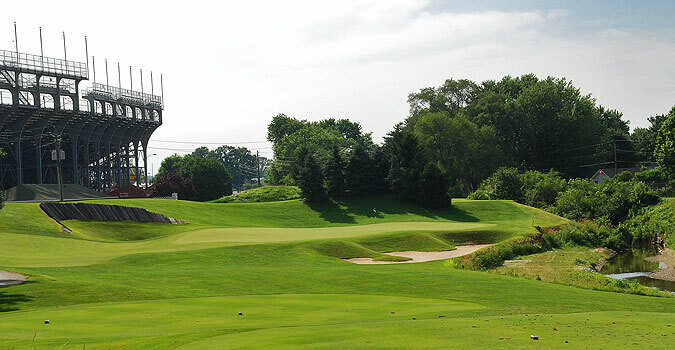 This is a wonderful golf course and we highly recommend a round here...More than any other course we have visited in Indiana - this is a MUST PLAY! Tony George (President of the Indianapolis Speedway) wanted a course that would compliment the world's best know racing facility - and would invoke a special feeling combining the tradition and heritage of the game of golf as well as of the fabled Speedway...What a success! ( for more history - read below) Those who have not seen the Speedway will find this a memorable experience - even if you are not a race fan. I have visited many stadiums and have been sandwiched amongst a hundred thousand people - but nothing compares to the immenseness of this environment. It is simply awesome! 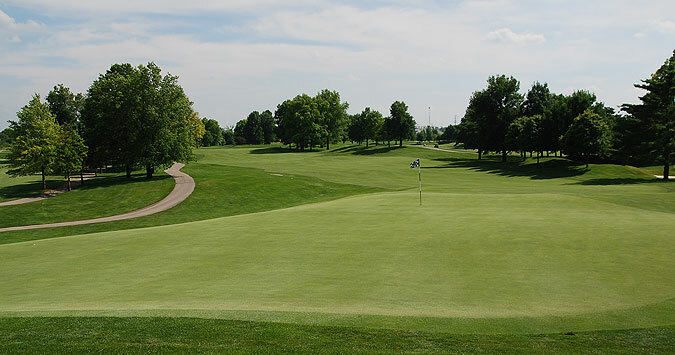 For more info on this golf course, visit our page for Brickyard Crossing, with direct link to their website by clicking here.